When you come to, the first thing you feel is intense pain. To the point of nausea. Smoke and steam stink the air, and you can taste blood in your mouth and feel sharp edges where your teeth had been. You hurt. All over. Your legs feel loose and disjointed, and they hurt. But when you hear the the sound of help coming, it's not God, it's a large angel in a blue flight suit. You can hear the helicopter landing as the firefighters cut your car in pieces to get you out. You are surrounded by concerned faces, and cold, and shaking. A warm blanket is placed over you. A needle pricks your arm and a mask is put over your nose and mouth - don't throw up - you think to yourself. Then you are slid into the back of a helicopter, and you look up into the eyes of a friendly giant. "Hi, I'm Les, how are you doing?" "Okay, we can help with that. What's your name?" You don't know it, but everything Les says and does has a purpose. He and his partner will quickly assess you and determine what lifesaving care you will require on the way to the hospital. You are lucky, because this man has cared for thousands of souls, and knows exactly what to do and say with a minimum of fuss or drama. If you stop breathing, he will breathe for you. If your loss of blood lowers your blood pressure he will handle that too. He and his partner have you and you are safe. You have met Les Langdale...and you are safe. Please join me in wishing him clear skies and tailwinds from here on out. This is on a slide that I use at the end of a role-playing scenario with the newest crew member in my class; me, and an old crusty. I talk to the oldster offline and tell him or her to play along with me as we proceed into a flight scenario with deteriorating weather. Lest you end up like these lucky souls. 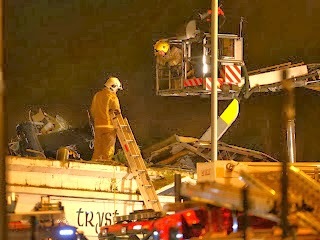 This is an update on the crash of an EC-135 police helicopter into a nightclub. The investigation has revealed that at the time of the crash, the switches that control the pumps that transfer fuel from the main tanks to the engine supply tanks were off. and aft transfer pump (XFER F and A) switches were set to the OFF position." It looks as if this was a simple human mistake made due to what? Complacency? Distraction? Being rushed? Skipping a checklist? 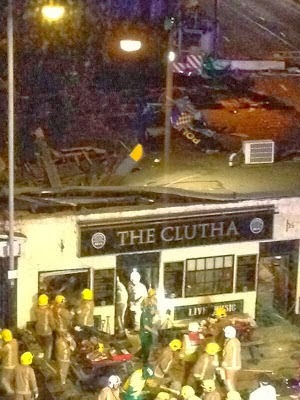 The pilot was over 50 and had over 5000 hours flying. Like me. This exact event happened more than once in a BK. Omniflight lost an aircraft and had a crew seriously injured. The pilot had a flight early in the morning right after arriving for work. He inadvertantly left the instrument lights on, and couldn't see the low fuel and master caution segments illuminate. Both motors quit. The crew was injured, he was paralyzed. The really ironic fact of this matter is that there is a way to correct for this human error, (forgetting to turn on transfer pumps). I used to fly a Dauphin, a French made helicopter. The Dauphin has supply tanks too, and transfer pumps. If you somehow forget to turn on the pumps in a Dauphin, there are small valved openings at the bottom of the supply tanks that will let fuel from the main tanks in, to at least the level of the main tank. It's an fool-proof feature. I wonder why the Germans didn't think of this? Or change the BK design after a couple of crashes. The French guys work with the German guys now. For "Airbus." Speak up boys! Later - I am going to write another post, and in it I am going to make a case for crewmembers in single-pilot helos calling out challenge-and-response checklists, but not today. Today I am going to consider, "but for the grace of God, there go I." And think about all those dead people. While flying to Macon the other night, I called Atlanta Approach and requested flight following. After a few minutes of quiet on the radio, the controller asked if I had time for a question. "What exactly is it that you all do?" "Well, tonight we are transporting a sick young patient from a small hospital to a large one where he can be taken care of by specialists. We also land at accident scenes and pick up trauma victims, from things like car crashes. Finally we transport little premature babies, as early as 24 weeks and less than two pounds." I reply, "Thank You sir. We could not do this without you." That video made me miss flying the Penn State blue and white Dauphin. She was a screamer, and her wheels went up. Since posting this, my company has experienced another tail rotor strike at a hospital helipad - the misfortune fell upon a long time friend and coworker. 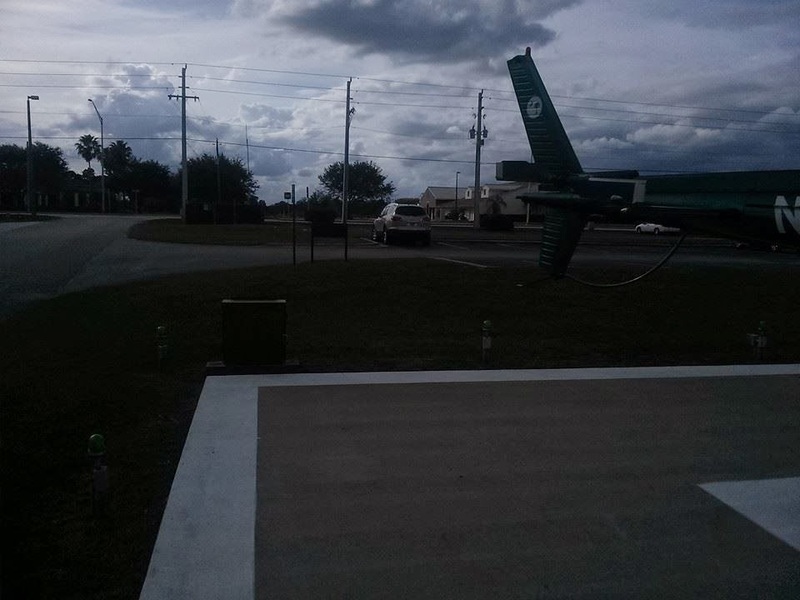 I landed at a small hospital's helipad a few days ago, and had a near miss with an obstacle. And this is a topic that I have written about, and thought about, and talked about. What the heck? In a recent post, I wrote about us helicopter pilots operating in a naturalistic environment. This means that our decision making - what we do with the aircraft, is naturalistic decision making (NDM). I can remember exactly the events that led to my near miss, and exactly what I was thinking, and why I was thinking it. 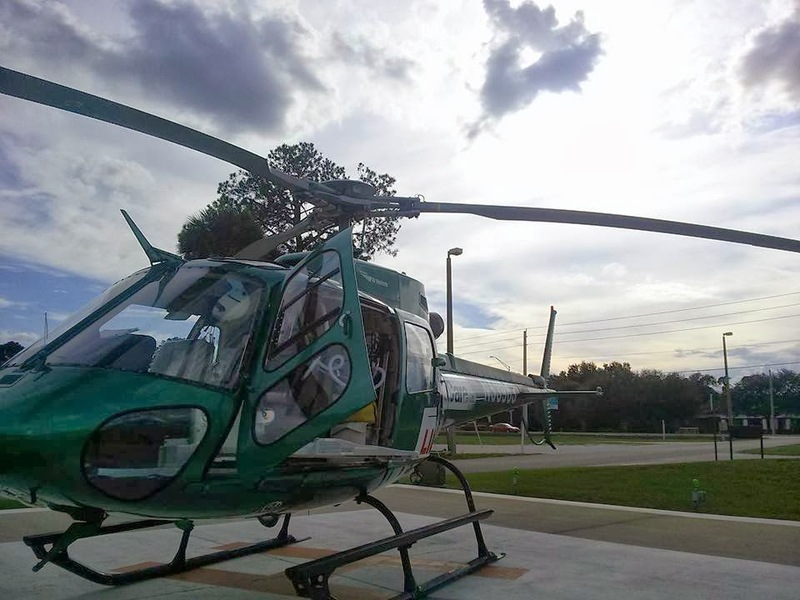 On the way to the Raulerson Hospital helipad in the town of Okeechobee Florida, I asked the crew to tell me all about the hospital and the pad. They described it pretty well, a ground based cement square with trees and wires in the way. They mentioned that the other pilots would "fly past it and come back from the other way." As we approached, I got eyes on the pad and did my high recon. Image oriented to show final approach path. Up is approx 90 degrees. I could see what the crew was talking about as we approached from the top of the image (headed west), turned right, and made our final approach to the east (see red line). The H is oriented approximately north/south, and the orientation of the H at a helipad indicates favored approach direction(s). In this case, trees block the north approach path, and a strong wind from the north ruled out landing to the south - downwind. I elected to take a crosswind from the left and flew in calling out obstacles and getting confirmation from the crew that we were clear of poles, wires, and the tree out the right door on short final approach. As I came over the pad, I instinctively began to put my nose into the corner at the top of the image. Then a conversation with Toyanna Frye came into my mind - literally as I was hovering. 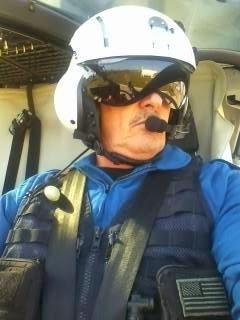 Toy is a flight medic at Walterboro SC, who I fly with often. 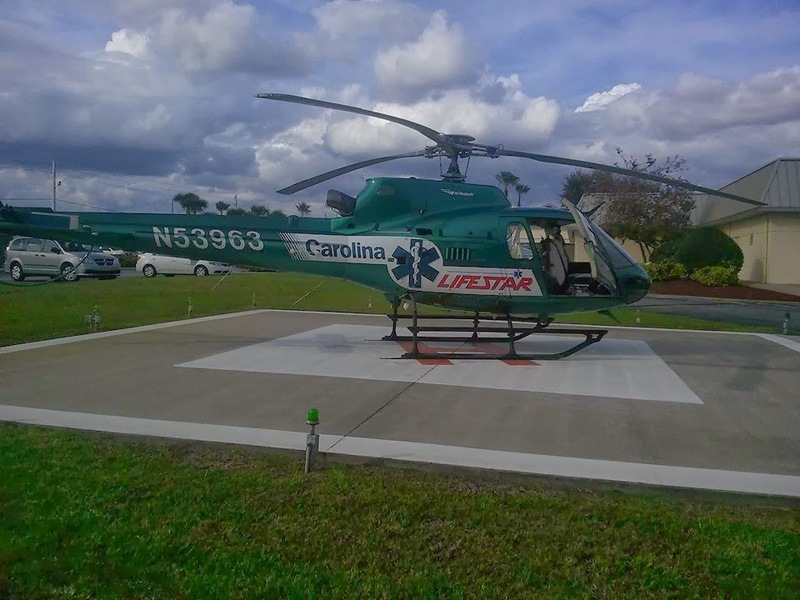 On a not-so-recent flight with her at Walterboro, as I was landing and putting my nose into a corner, she asked me to stop moving so far forward as it made it hard for her to load a patient without having the stretcher fall off the edge of the pavement. 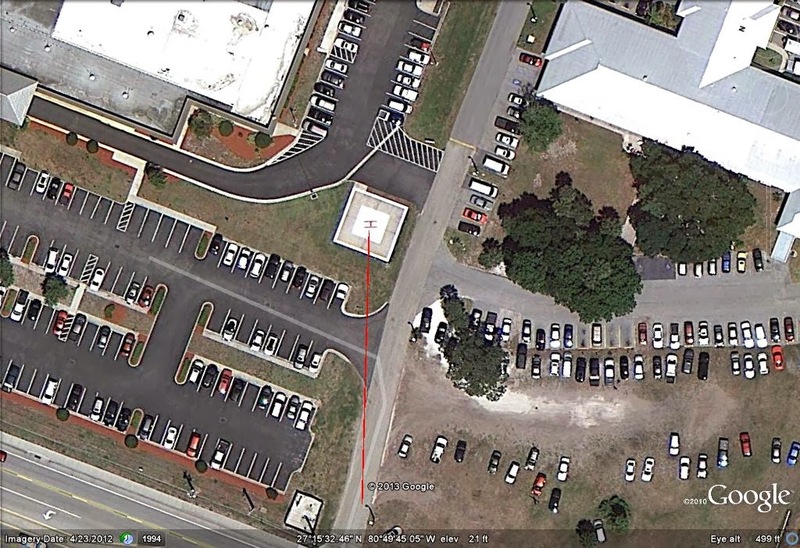 The pad at Walterboro is bigger, and obstacle free, so I accommodated her. (Being accommodating has caused much trouble and damage to helicopter pilots and helicopters in tight landing areas. After approach and landing safely, we move the aircraft to make things easy for the crew, and end up hitting things). So I was moving forward at Raulerson, then thought "better" of it and stopped, and landed. Perhaps it was a touch of cognitive dissonance. I landed, shut down, and climbed out. This is what I saw. I noticed that the lights stood up further than normal and presented a hazard to a low tail like on a Bell 222 or 230. I walked around to the front. That's when I saw the real hazard, back behind the aircraft. I walked to the rear. At debrief I showed that picture to the crew who said, "been here a hundred times, never saw that." I was lucky. This time. "MAST=Military Assistance to Safety and Traffic. 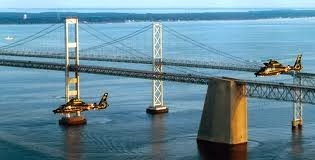 I flew on those BEFORE Lifestar existed. 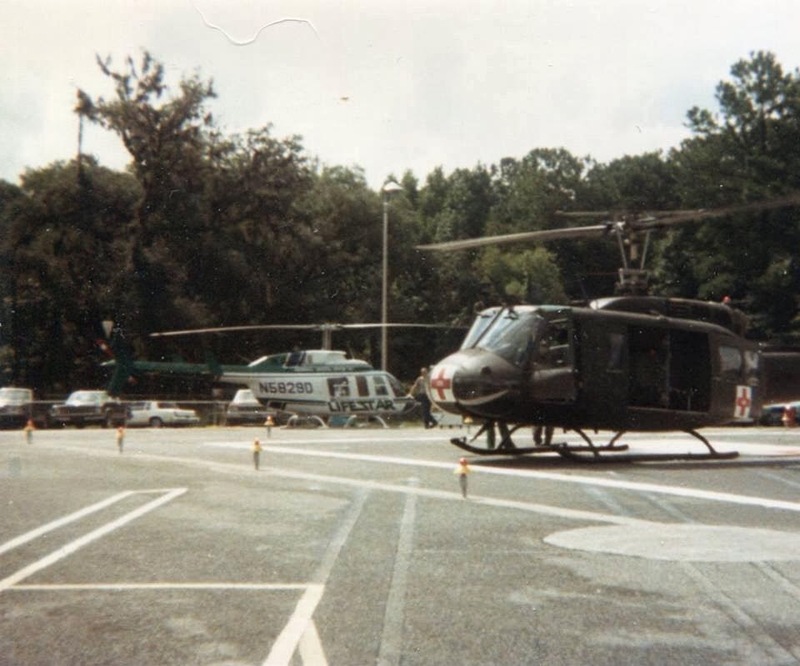 Dr Boyd formed the Trauma Transport Team in 1982, and we used MAST helicopters, UH-1s out of Ft. Stewart. The smaller aircraft is the original Lifestar ship (a Bell LongRanger, or 206L) from when the program became operational on July 1st, 1985. It was replaced by the BK in 1987." courtesy of David Winnette and Cari Hamelink.